BOSTON, MA--(Marketwire - April 24, 2008) - WeeWorld, home of the WeeMee™, the most widely used portable avatar in the world, announces the success of its Partner Program and opens its API (application programming interface) for all sites to integrate WeeMees to create a more engaging and personalized online experience. WeeWorld, the most popular interactive avatar community, has cracked the code on a mainstream avatar spanning all demographics. The success of the WeeWorld Partner Program is due to the universal appeal of the WeeMee and a streamlined offering that allows all websites and publishers to easily augment their online services and content by using the customizable avatar. More than 21 million WeeMees have been created to date and more than 600,000 new ones are created every month. WeeWorld's initial partner success included implementations on AIM, Windows Live Messenger, and Skype messaging platforms. Users on these sites create a uniquely expressive avatar that animates in response to chat. As users change their WeeMees' outfits or expressions, their WeeMees are updated across all partner sites, creating a dynamic and user friendly visual identity. Based on the success of those initial partnerships and the growing interest from brands and publishers to use WeeMees on their sites, WeeWorld created a simple API to rapidly scale to meet rising demand. After successfully testing the API with several partners, including USA Network (www.usanetwork.com) and the NHS (www.nhs.uk), WeeWorld has opened its API to all potential partners today. "WeeWorld's extensive reach and suite of avatar assets and networking features appeals to users of all ages and backgrounds," said Alexandra Shapiro, Senior Vice President, Brand Marketing, USA Network. "The WeeMee integration to USA Network's Character Arcade adds a unique and personal element to our gaming experience and keeps our users continuously engaged. We are proud to partner with WeeWorld and look forward to finding new ways to evolve and grow our partnership." and 60 percent of all registered users have made a WeeMee. as they engage with others in the massive employee community. "Today's consumers demand self-expression and personal communication throughout their online lives. As we build on the successes of our partner program, consumers will be able to use and access their WeeMees on more and more sites," said Lauren Bigelow, General Manager and SVP of Marketing, WeeWorld. "The opening of our API pushes WeeWorld's reach even further as WeeMees quickly become the avatars of choice for brands and service providers around the globe. In fact, more enhancements are already in the pipeline for our API to ensure our growing list of partners will be able to seamlessly personalize the experience on their sites." In addition to USA Network and the NHS, WeeMees are already being used in a variety of ways through WeeWorld's established API to personalize website offerings. These sites include BusRadio (www.busradio.com), MyMissyMe (www.mymissyme.com), My Neighbourhoods (www.myneighbourhoods.co.uk), Recommendr (http://www.recommendr.com/), Shortstack Publishing (www.shortstackpublishing.com) and Vringo (www.vringo.com). Companies interested in the WeeWorld Partner Program should contact a representative at partners@weeworld.com. WeeWorld (www.weeworld.com) is the most popular interactive avatar community and a trusted site for dynamic self-expression, creation and communication. Through an expansive palette of features, clothes, accessories, hobbies, etc., WeeWorld users can create their personalized WeeMee avatar, connect with friends, decorate their own visual space, send animated messages, play games and more. More than 21 million WeeMees worldwide are redefining avatar demographics and establishing the WeeMee as the world's most widely used and recognized avatar. WeeMees can be created on many sites including Windows Live Messenger, AIM and Skype, and are portable to all major social networks and blogging sites. WeeWorld has offices in Boston, London and Glasgow, and is funded by Accel Partners (www.accel.com) and Benchmark Capital (www.benchmark.com). 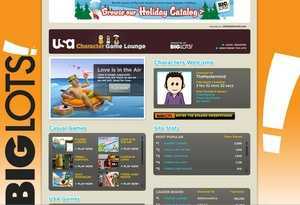 Sixty percent of registered users on USA Character Arcade have made a WeeMee.